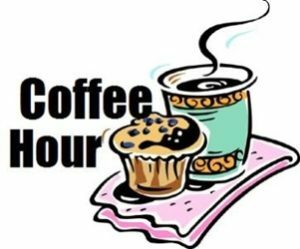 Join us Sunday mornings after worship for our weekly coffee hour, full of coffee, fruit, bread, bakery treats & more to enjoy! It's a great time for members, visitors & friends to get to know each other a little better. How Did Coffee Hour Start? Coffee hour came about shortly after we suffered a fire in 2005. We all needed a time to hang together and talk about what just happened and how to go forward. Since then, Coffee Hour has grown substantially! Our new building and fellowship area can accommodate all who wish to stay for coffee and treats. It’s truly wonderful to see the numbers we have enjoying coffee hour each Sunday. The “Donation Basket” PLUS the generosity of each group that donates the food and treats on Sundays makes it a self-sustaining project. The Donation Basket also makes it possible for us to have a pantry that is full of supplies for coffee hour as well as many other events involving our kitchen and fellowship hall, including coffee, creamers, sugar, plates, napkins, utensils, dish soap, butter, placemats, salt, pepper, etc., etc., etc . . . There are several teams/groups with a leader for each one and there is a suggested list of items posted in the kitchen that folks seem to like, although a creative mind is always welcome . . . feel free to make something new or different on occasion. Your team’s obligation will only be 4 – 5 Sundays per year. If you can’t make it on your assigned date(s), we suggest you give your team leader some money to cover your portion, so they can purchase something on your behalf. Other options are to purchase something and bring it to church ahead of time or get it to your team leader or someone else on your team. Teams can even do a theme Sunday, if they wish! How fun!! Also, teams should be aware of which Sundays they have based on the calendar and if it falls on a Holiday or time when attendance might be lower . . . or if it is a Sunday when there will be more people . . . such as a Baptism Sunday or Confirmation Sunday. Please keep in mind that each Sunday we serve anywhere from 80 – 100 people at Coffee Hour. Several of the teams only have 5 or 6 people. That means each person should expect to provide enough treats for 15-20 people, so we have enough for everyone. Brigette makes up the schedule for the whole year, accommodating special needs/dates for certain groups, so that you all know well in advance when your group is serving. If your team needs to adjust anything for a future schedule, please contact Sue Manzke or Brigette in the church office by November of the current year. Assigned groups need to be here around 8:15 am in order to get everything ready and then also plan to stay after to help clean-up. Please do! If you and/or your family enjoy the benefit of Coffee Hour on a regular basis, we’d appreciate your help on the serving side. You can even join more than one team! Many of the people currently helping actually serve on 2 or more teams. You don’t need to be a church member to help, and your participation would be especially appreciated to lighten the load of a team that could use a few more hands. Don’t be shy! Please contact Brigette in the church office at 262-547-2424 or EandRoffice@gmail.com or Sue Manzke at 262-510-9215 or manzkes@gmail.com. In an effort to be a “greener” church environment, we’re urging teams to use the beautiful china dishes and the dishwasher rather than paper. Please let Sue know when you’d like to do this, and she’ll arrange for someone to help out the first time. IT IS NOT HARD . . . AND IT DOESN’T TAKE MUCH MORE TIME THAN THE PAPER WAY. Plus, someone will help with the dishwasher to quell the fear of it. If each team uses the dishwasher at least once per year, it’ll cut the cost of the paper products considerably, which are more expensive than Styrofoam . . . so let's all give it a shot! When setting the serving table, please be mindful when putting out utensils. We can cut down a lot of waste by limiting what we put out. It’s usually NOT necessary to put out spoons unless you’re serving something that requires them. There are stir sticks for coffee. Also, the same with forks . . . unless you need them, please don’t put them out. Knives are for rolls and butter/jelly. If you put utensils with the item they’re meant for rather than at the beginning, they won’t go unused and be thrown away.